ParaView 5.4 enriches the color legend and restores axes per dataset. Kitware team members will call attention to ParaView 5.4 in a workshop at ISC High Performance 2017. After previewing ParaView 5.4 in a series of blog posts, Kitware pushed the final version. Together, thirty developers added over 430 commits to the software. “We revised the color legend with significant improvements in the choice and placement of graduations and annotations,” said Utkarsh Ayachit, a distinguished engineer and the lead developer of ParaView at Kitware. The Multi-block Inspector panel, through which users review and modify properties for blocks in hierarchical multi-block datasets, received a redesign with performance and usability in mind. The approach for loading state files in ParaView changed. The approach now allows ParaView to “Search files under specified directory.” This ability lets users share state files along with the datasets that these files need. Reformatted dialog boxes for saving screenshots and animations improved access to options that affect saved results, including color palette, background transparency and spacing between views. Axes Grid, a mechanism for annotating coordinate axes in three-dimensional views, extended to annotate each individual dataset. The CFD General Notation System (CGNS) file reader gained support for boundary condition patches for curvilinear grids and support for block selection according to family names. The number of supported VTK-m filters increased. Individually, these filters offer accelerated cell and point averaging, clipping, unused points removal and general surface extraction. In addition, the VTK-m contour filter acquired the ability to specify multiple isocontour values. Support improved for High Dots Per Inch (HiDPI) displays such as Retina. 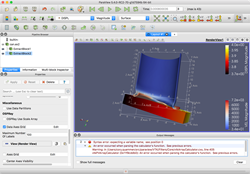 ParaView is an open-source platform that helps users connect with scientific data. To learn about Kitware products and services for ParaView or to set up a time to meet with Kitware at ISC High Performance 2017, please contact kitware(at)kitware(dot)com.